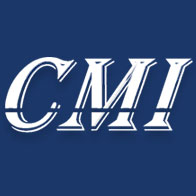 Welcome To CMI Structural Solutions! Way back, 22 years to be exact, the team at CMI opened the doors to what would become one of the most trusted structural engineering firms in Upstate New York. We noticed that there was a definite need for our services and decided to take a chance by opening CMI Structural Solutions and it has been a great ride to this point. We have no plans to stop here and will continue to offer the best possible service to our clients and their projects. Our commitment to quality is evident in thousands of completed projects. We place our stamp of approval on each and every job that our talented team has a hand in. So bring on the tough jobs, we feel they just make us better. 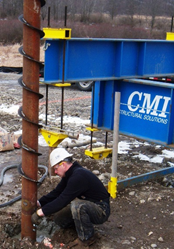 One of the CMI signature solutions is a system called Geo-Joist. Geo-Joist is a revolutionary form work engineered to be energy efficient, cost conscious, and extremely fast for installation. The ideal solution for bad soils, the Geo-Joist eliminates the need for frost walls, saving massive excavation costs, engineered to save you money on installation while providing superior performance. Eliminating the need for insulation and a vapor barrier is a major upgrade from traditional slab systems and is proven to be a viable alternative. Increasingly, the desire for heated flooring has become a very popular option for both business and commercial applications. The advantages of heated (or radiant) flooring are not limited to simply comfort applications. The climate of Upstate New York is not known for its tropical breezes and steady, comfortable temperatures. 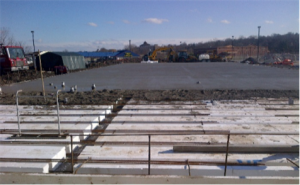 With Geo-Joist, the radiant heat flooring is mounted throughout the slab and can extend into any other areas that would benefit. For instance a dock area may be on the north facing side of your building and if you are concerned about the area icing up, radiant heating can eliminate the possibility of snow and ice making a mess of your dock area. We would like to thank you again for stopping by to visit CMI Structural Solutions, your local geotechnical design and construction contractor. Get your project done – on time, on budget and impeccably designed. Please do not hesitate to give us a call and see what our experienced foundation consultants can do for you! Be sure and check back often for more from the blog feed!